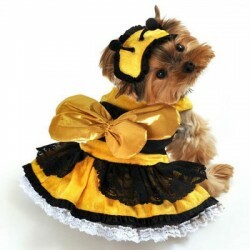 Shop Our Great Collection of Halloween Costumes for Your Precious Pup! We have a great variety of styles & sizes but shop soon because the costumes do sell out fast! **Please allow 3-5 business days for order processing in office. Please allow 3-7 business days for transit time within the U.S.
Two piece dog chef baker costume, includes white uniform pants costume with attached red chef scarf .. Fashion meets furry with this fun shirt! A poly/cotton sleeveless shirt for every day wear, double .. Fashion meets furry with this fun shirt! A poly/cotton sleeveless shirt for every day wear, double s..
For Your Li'l Punkin! A poly/cotton sleeved hoodie for cold weather days, double stitched in all the..
New this year...Lion Costume for Dogs includes an adorable lion headpiece with red ear accents. &nbs.. This eco friendly limited edition 6" Pumpkin is the perfect prize for your little pumpkin pup. It i..
A fun elastic necklace adds a little charm to any pet! For special use only, not a restraint device..
Two piece blue and yellow snow princess tiered tutu lace trim dog dress costume with red bow headpie.. This limited edition Black Spring Chicken is perfect for your dog. Soft and plush with a squea..